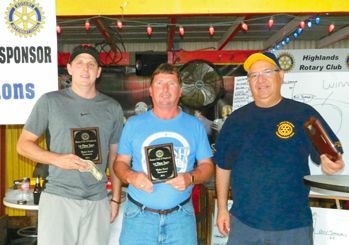 HIGHLANDS  Bragging rights, and a chance to trounce an old opponent, were the major prizes in last Saturdays Highlands Rotary Clubs 8th Annual Washer Tournament. 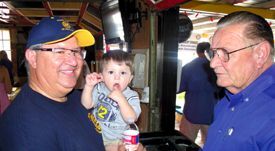 Nice weather encouraged a large crowd to turn out for the event, which was held at Charlies Ice House in Highlands. Over 30 teams competed, many of them from surrounding communities and Rotary District 5890, as well as Highlands and Crosby. Last years winners were on hand to defend their titles if possible. Rotary raises about $10,000 every year, which it sends to the national Rotary Foundation for projects worldwide, including Polio Plus eradication initiative. In an unusual arrangement, after 3 years the foundation returns half the money for local projects in District 5890 and Highlands. BAYTOWN  One has to remember when Ken Jones was the Captain of Precinct 3 under Constable James Douglas as this reporter does, a reporter would hear almost anything from anybody and then defer to Ken Jones to find out the unvarnished truth, the facts that had not gone through the spin cycle. In the last election he had 70%. CROSBY  The Crosby Fairgrounds teamed with cooks and fans of cooking for the When Pigs Fly Cook-off last Friday and Saturday. By Saturday everyone was fully excited about the event. Ceremonies were presided over by Miss Moo, herself last Saturday. The Houston Livestock Show and Rodeo Metro-Go Texan Committee -Crosby collected $8,245 from the auction alone before the awards this year, plus $1,000 more contribution from Captain Jasen Rabalis. There was also first place hospitality and first place margaritas this year. Local folks cooked up a $10 fish fry dinner before events on Friday evening. Nearly $36,000 in scholarships go between Crosby and Huffman each year. Contributions are still accepted at www.eventbrite.com. CROSBY  According to the Harris County Sheriffs Office an investigation has begun of an apparent stabbing of a Dayton man at a local off-road facility on September 7 at about 1:00 a.m.
A man that was flown to Memorial Hermann Hospital from Texas Medical Center in Atascocita told sheriffs deputies that during an altercation that included racial epithets by one attacker, he was beaten by several males and stabbed as he was on the ground. He was in critical condition during the flight. As of Tuesday, he was said to have a good prognosis for recovery. He told deputies that while he was inside a truck, a man began to shout racial slurs and challenged him to get out of the truck. He did get out of the truck and described being punched and kicked originally by one tall white male with straight blond hair about the age of 34 to 38 years. Then he described several others getting involved in the punching and kicking until he balled up on the ground. He indicated that friends help him get up and into a truck that drove him from 807 Beaumont Highway to Atascocita. He was driven apparently by friends to Texas Medical Center but a Lifeflight helicopter was soon called to take him to Memorial Hermann. He was described as being critical, having a bilateral abrasion above his left eye, had many bruises and an apparent stab wound. Sources indicate the victim played football last year for the Dayton Broncos. A potential witness indicated that the victim may have said something provocative to a female at the location but declined to get involved further. HIGHLANDS  Jackie Young and her parents lived in Highlands for many years, from 2003 to 2011, until they determined that their health was at risk from toxins in their well water. Their house was previously owned by the Smitherman family, at the north end of Main Street. As a result, Jackie is now working for TexansTogether, an activist group headquartered in Austin, dealing with public issues such as the environment, education, and voters rights. 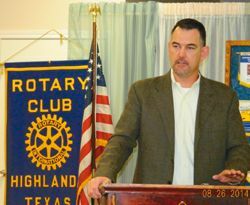 Jackie told her story, and an update on activities around the Waste Pits in the San Jacinto River, to the Highlands Rotary Club at their luncheon on August 19th. She told how her family, especially her father and herself, became sick with seizures and lesions. Even the pets were sick, she said. The family was forced to quit using well water, and import a fresh supply. When they did that, their health improved. Her plight was recently told in a full page editorial cartoon by Houston Chronicle artist Nick Anderson, who has championed her story and cause. Jackie went on to get an environmental geology degree from the University of Houston. Her focus since then has been on the toxic waste pits in the San Jacinto River, and their potential danger to the publics health. Although the waste pits may not have affected her well water (she says the source is problematic), she says the Highlands area has 4 Superfund sites nearby, and there is a high rate of illness in areas such as Highlands, Channelview, and Baytown. It is known that the waste pits contain dioxin and furans, which can enter the body through breathing, absorption, and eating and drinking. The are known to cause various types of cancers and other diseases, she said. Working with TexansTogether and the San Jacinto River Coalition, she wants to have the toxic wastes removed from the site permanently. She said this is one of six solutions now being studied by the federal EPA and the Corps of Engineers. A final decision is due in 2015. 4. Partial solidification in place. 6. Full removal. This would require 16 months, and cost $100 to $635 million to remove 208,000 cubic yards.